We asked London event florist and Flower Market devotee, Pinstripes & Peonies, to create a few sample designs for British Flowers Week using his favourite British-grown flowers: stocks. 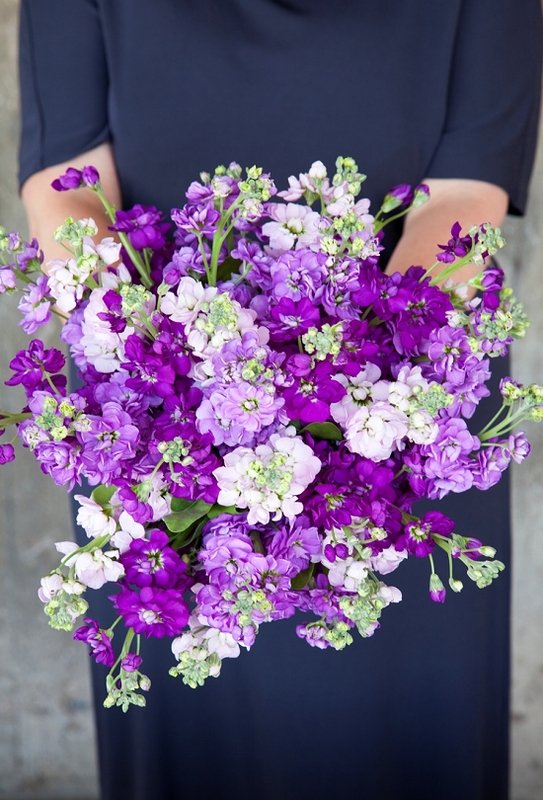 As well as being knocked for six by the richly scented flowers, we were bowled over by the purity of the colours and how effective stocks are when used on their own in a design. 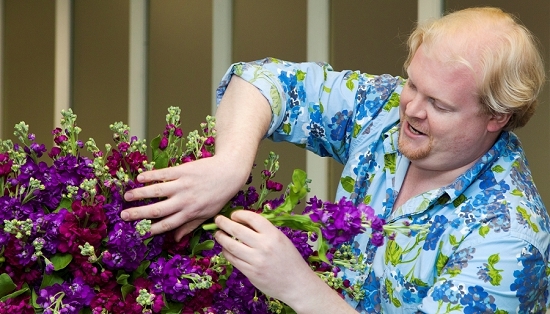 "Stocks are a fantastic British summer flower to use: their perfume is just delicious and the range of colours makes them so easy to use for all sorts of jobs," says Ruari McCulloch of Pinstripes & Peonies. "I often use stocks as the only flower. Sometimes simple is the best way. 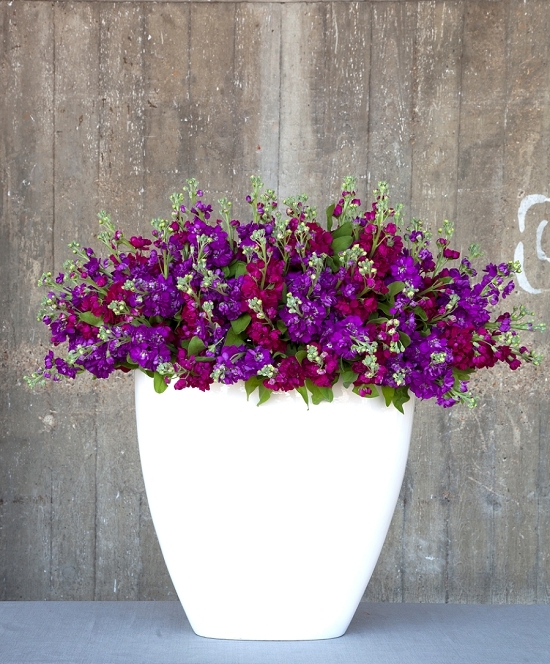 You can use them en masse in big urns either mixed colours or singly. You can use them hand-tied for the perfect scented bouquets or in striking vases for larger areas. We used white British-grown stocks in vast white vases for a party at the Hurlingham Club recently and they looked amazing." A striking, dramatic contrast of an expanse of pure white vase and vibrant pink and red stocks. 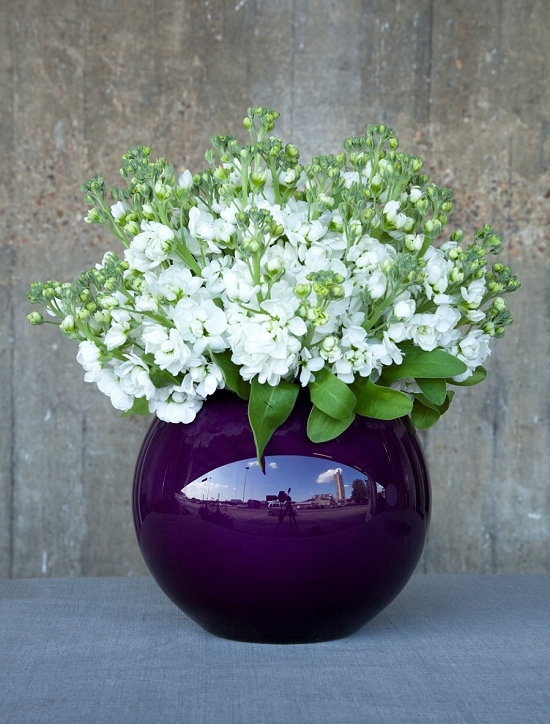 The pure white of scented stocks against a deep purple goldfish bowl – perfect for a summer party, an entrance hall or office. 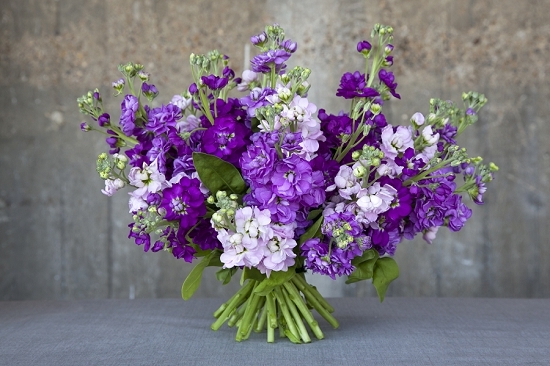 This soft lilac hand tied bouquet of scented summer British stocks shows the soft, natural beauty of the flowers to perfection. Simple, stunning, stocks.